Two people taking a walk along the Mornington Peninsula coastline. While many east-coast Aussies head north for summer, wise wanderers travel south to this idyllic beach haven. The Mornington Peninsula is a finger of fertile farming land and bush separating Port Phillip Bay and Western Port south-east of Melbourne. Taking the EastLink bypass, it’s just over an hour’s drive from Melbourne (tolls apply); or an hour and half from Tullamarine airport should you wish to fly in from interstate and hire a car. You’ll need a car here, so you have the freedom to stop at any cellar door and farm gate that takes your fancy. Why IS the Mornington Peninsula so great? Many holiday locations claim to have it all, but the peninsula really does. It’s the perfect summer break thanks to its beaches. The sandy shores of Port Phillip Bay offer boating, fishing, safe swimming and beachfront camping. The west coast faces Bass Strait, so there are amazing surf beaches. On the Western Port side, there are more surf beaches and views across to Phillip and French Islands. Stay at the light: Cape Schanck Lighthouse, Mornington Peninsula. 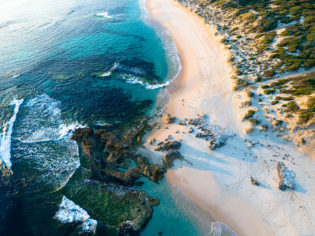 The MP has a romantic, nostalgic vibe thanks to painted beachfront bathing shacks and wooden jetties, tall pines and gum trees lining country roads (many of which are still dirt), and windswept beaches where kids fly colourful kites. Then there’s the food and wine. The Bay Trail: 28km from Portsea to Dromana. Point Nepean National Park: A natural beauty at the tip of the peninsula; you pass the historic quarantine station and WWII housing. Two Bays Walking Track: 26km from one side of the peninsula to the other (Dromana to Cape Schanck). Keen amblers can tackle the 100km Mornington Peninsula Walk, which combines all of the above; people who prefer short strolls can embark on short trail sections. It’s hard to believe you can swim with dolphins this close to a city, but the real suprise Polperro Dolphin Swims give is that you can swim with seals on the same trip. The longest-running and most enthusiastic operator on Port Phillip Bay takes out small groups on a cute wooden boat. While it’s not guaranteed you’ll swim with dolphins, it is likely as there is a pod of up to 60 bottlenose dolphins in the bay, who love to surf the bow. A three-hour trip also takes you to Chinaman’s Hat, where snorkellers come face to face with curious seals. Often compared to Scotland’s Fife district due to the concentration of clubs here, the Mornington Peninsula has a mix of traditional and links courses. Natural dunes create lovely rolling hills and natural sand traps, and most courses offer amazing sea views while you play. Go here to find out more. We went for a spin in a golf cart around RACV Cape Schanck Resort, which is a beautiful spot for a thwack, and has a great club, bar and affordable accommodation onsite too, with stunning views. RACV and NRMA members get discounts on accommodation. You can also get personal training sessions from resort pro-golfer Peter Tate. On the Bass Strait side of the peninsula, in the Mornington Peninsula National Park, you’ll find Portsea Surf Beach, Sorrento Back Beach, Rye Ocean Beach, St Andrews and Gunnamatta Surf Beach. Paradise (close to Melbourne) found: Mornington Peninsula. The surfing is great but there are strong rips, so be careful when swimming. Around the point from Cape Schanck, towards Western Port Bay, there’s Point Leo, Merricks and Balnarring surf beaches. For beginners’ surfing lessons, contact Mornington Peninsula Surf School. Mornington Peninsula has been a land of orchards and artisan food producers for over a century, and it shows. They have gourmet gallivanting down to a fine art. A good place to start is the Red Hill Farmers’ Market, held from 8am to 1pm every fourth Sunday of the month (except December, when it’s on the 18th due to Christmas) at Red Hill Consolidated School on Arthurs Seat Rd. As well as local producers, you’ll meet boutique winemakers who don’t have cellar doors. Another one-stop shop for local foods is Cellar & Pantry (141 Shoreham Rd, Red Hill), a great place to grab picnic supplies. Most cellar doors also stock local produce, and many make their own olive oil and vinaigrette. Hotels should also have the free Mornington Peninsula Gourmet Guide at reception, or you can download a foodie trail map. But be sure to add these to your must-see list: Main Ridge Dairy (cheese factory and goat farmers, 295 Main Creek Rd); Mock Orchards (biodynamic apples, pears and cherries – try its yummy alcoholic apple cider, 1095 Mornington-Flinders Rd); and Sunny Ridge Strawberry Farm (pick your own, 244 Shands Rd, Main Ridge). Peninsula Hot Springs is the most impressive thermal springs facility AT has visited because it takes into account the outdoor Aussie lifestyle: the 500C water is pumped from 637m below ground into a series of 20 outdoor soaking pools in a natural coastal scrub setting, among tea-trees, she-oaks and banksias. The Hilltop Pool is just spectacular, giving 360-degree views. There’s a range of really cool indoor spa facilities here too, including steam massage treatments and hamam workshops. (Springs Lane, Fingal. 03 5950 8777;). Horses are well loved on the peninsula, with plenty of trail-riding opportunities. Spring Creek Farm leads winery tours and Gunnamatta Trail Rides offers beach rides. If you have kids, head to The Enchanted Maze Garden at Arthurs Seat (55 Purves Rd). As well as manicured garden mazes, there is a tube slide ride, sculpture park, indoor maze and lolly shop. While you’re here, continue up the hill to Arthurs Seat lookout (free parking, bushwalking trails). Thanks to premium produce and a focus on fine dining, you have to try pretty hard to have a bad meal on the peninsula. There are five hatted restaurants within 30 minutes’ drive of each other: La Pétanque (French cuisine, 1208 Mornington Flinders Rd); the Port Phillip Estate Dining Room (modern Australian, 263 Red Hill Rd); Ten Minutes By Tractor (try the wallaby! 1333 Mornington Flinders Rd); The Long Table (laid-back and full of good vibes, 159 Shoreham Rd); and Montalto Restaurant (rustic chic, 33 Shoreham Rd, Red Hill South). Then you’ve got Stillwater at Crittenden (formal and pretty, perfect for weddings, 25 Harrisons Rd) and Max’s at Red Hill Estate, which was awarded Best Tourism Restaurant at the recent RACV Victorian Tourism Awards. Max’s at Red Hill Estate is a wonderful example of the Mornington Peninsula’s holistic approach to business – a family-run operation, it is an award-winning producer of chardonnay, pinot noir and pinot grigio, it produces food products such as olive oil and Max’s fantastic, award-winning morello cherry balsamic vinegar, and it offers gorgeous boutique accommodation both at the vineyard and nearby in Red Hill South. Local tips for more casual eating include Foxeys Hangout (795 Whitehill Rd, Red Hill), Somers General Store (2 The Boulevard, Somers) and Merricks General Wine Store (3460 Frankston-Flinders Road, Merricks). The first vineyards were planted here in the 1970s. Predominantly cool-climate, the Peninsula’s flagship variety is pinot noir but it produces cracking chardonnay. Boutique varietals are added all the time due to microclimates within the peninsula. There are more than 50 cellar doors and 200 vineyards to explore. The best way to construct your own tasting schedule is to go to Mornington Peninsula Vignerons’ website and download a wine-touring map which shows all the cellar doors. Many are open daily because they have restaurants attached (see, they can’t help themselves – it’s a foodie-on-a-diet’s worst nightmare! Oh, let’s be honest, it’s a dream come true). Major wineries include Stonier Wines (2 Thomsons Lane, Merricks), Crittenden Estate (25 Harrisons Rd, Dromana), and T’Gallant Winemakers (1385 Mornington-Flinders Rd, Main Ridge). Foxeys Hangout winery, Mornington Peninsula. Also check out Red Hill Brewery for excellent pale ales, wheat beer and Bohemian pilsner. A country estate with vine rows on one side, bush on the other and wedding-worthy gardens in between. The restaurant has a new exec chef, Rodney Graham, who has worked in Michelin-starred restaurants in the UK. 142 Arthurs Seat Rd. There are just six suites here, and they are the epitome of modern luxury. We love the huge Bill Henson photos in each room. If you don’t stay here, dip into the decadence by booking lunch or dinner at the Dining Room. 263 Red Hill Rd, Red Hill South. Have you heard of Mornington Peninsula’s other side?